Photo via Younger Toyota Blog. 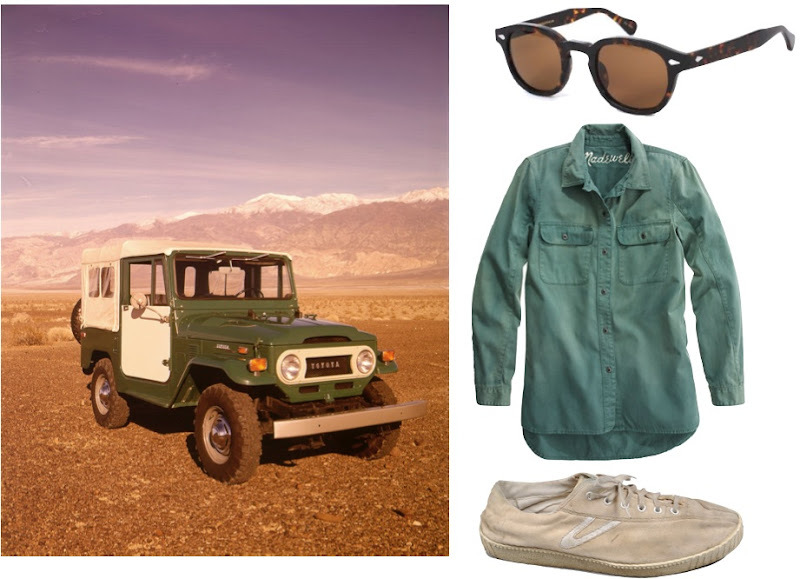 Moscot Sunglasses ($218); Madewell Station Workshirt ($88)—I have this shirt and LOVE it; Tretorn Nylites ($65). Love the Tretorn Nylites! Now I need to get a white on white pair and break them in. One of my favorite vehicles ever. And love the Tretorn's. I think I bought Penelope her first pair when she was just walking. Awww a Shorty Forty! They are such great cars for rugged areas. This outfit is perfection. I want to get my hands on those sunglasses asap. FJs rule. I was to buy one years back, but bought a house instead. Workin on a garage now for the second house... then (maybe) an FJ, or ole Rover, or 911t Porsche.